Chicken Cordon Bleu Pasta Salad is a perfect summer pasta salad with a bit of a fancier side – all the frills of Chicken Cordon Bleu, but perfect to bring to any picnic, party, or BBQ! With the end of August here, summer is finally drawing to a close. In spite of my distaste for hot weather and sunburns, I’m finding myself wishing I’d spent more time outdoors in the last few months, fighting off the heat and mosquitoes to enjoy the company of my friends and family. And of course, some incredible grilled food, paired with a couple of my favorite summer wines. Thankfully, I’ve got one more chance to bid summer farewell – and a Labor Day picnic sounds like a perfect celebration! 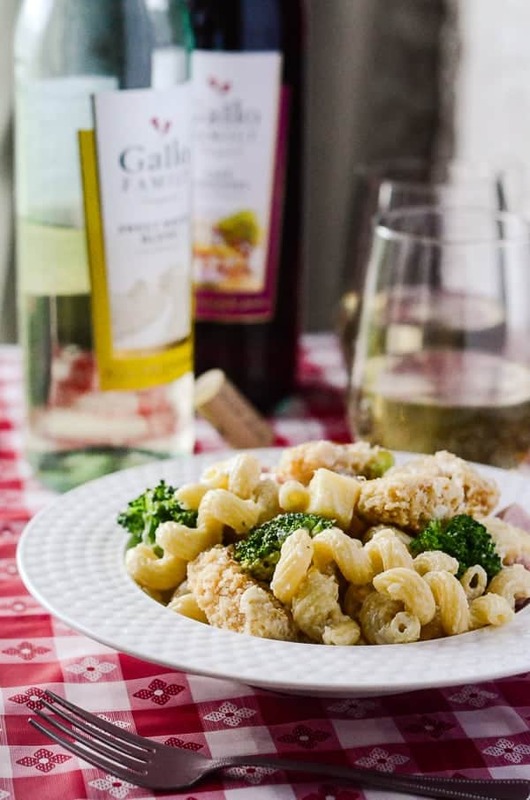 This week’s #SundaySupper is all about Labor Day grub, and I’m excited to be able to share a recipe that pairs perfectly with Gallo Family Vineyards sweeter wine selection. Sweet wines are essential to a summer party, in my opinion, and Gallo has both a red and a white that will totally cool you down under that hot, hot sun. What are your plans for the long weekend? 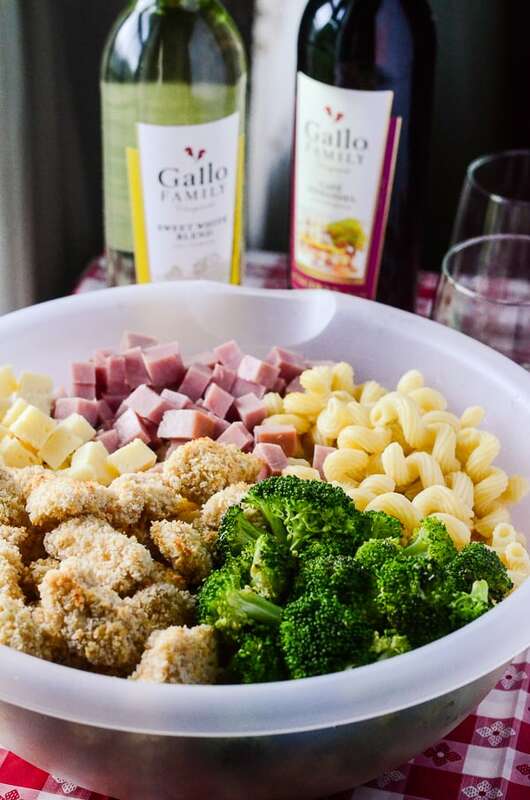 If they happen to involve food, how about instead of hauling a generic pasta or potato salad to your celebration, you surprise everyone with this snazzy Chicken Cordon Bleu Pasta Salad? It’s everything you love about the famous chicken dish, complete with a side of broccoli mixed right in! I distinctly remember the last picnic I was on, even though it was about nine years ago. Mr. Crumby and I were still a new couple, completely enamored with each other and regularly shunning everyone else in our lives in favor of one-on-one time with one another. Neither of us are particularly proud of that fact, but I wouldn’t change a thing about our early relationship. During our getting-to-know-you relationship stage, we discovered our mutual love of St. Augustine. One day in early September, we drove the forty-five minutes route to spend the day, complete with a packed picnic lunch to enjoy on the grounds outside the Castillo de San Marcos. We sat under a scraggly tree, and had to continuously move around the base of it to stay in the shade as the sun moved across the afternoon sky. We ate slightly soggy tuna sandwiches, and a fruit salad that was way too big for two people. We drank iced tea that was a little too warm, in spite of the cold packs we packed around it for the trip. We had to share a cupcake, because I’m clumsy and dropped mine in the dirt. And the kicker of the day – a bird pooped on my shoulder. Kind of disgusting, yes, but that picnic date is one of my favorite memories of “us” and our fresh love. We talked, we laughed until we cried, and we totally fell head over heels for each other that day. Walking down the streets of St. Augustine today, still hand-in-hand over nine years later, fills me with joy, and not just because the city is full of charm. They say having a bird poop on you is lucky anyway, right? Picnics and patriotic holidays are a perfect pair, and I think it’s high time I planned another one. Labor Day is a holiday observed by over eighty countries worldwide, and, while different everywhere, the idea at the heart of it is the celebration of the laborers that helped put and continue to keep the country together. In America, it’s the last excuse of the year for us to get together and enjoy a great Monday off work, eat BBQ, drink beer, and annoy our neighbors with sparkly explosives. It’s also the official end of summer, with school back in session and family vacations being safely tucked away in photo albums. For me, it’s a workday – food retail rests for no one, and someone has to be there to provide everything you all need for your parties! But you can bet that, after my work is done, I’ll be hitting a party of my own, with a big bowl of this pasta salad and a few bottles of Gallo Family wine in tow! I managed to work every delicious detail you find in Chicken Cordon Bleu into this dish! From the breadcrumb-studded chicken, to the melty cheese sauce, to a side of broccoli florets, this pasta salad has it all, and you don’t need a knife to eat it! It’s a fantastic, unique recipe that demands to be enjoyed outside, preferably by a body of water, with a glass of wine in hand. When it comes to pairing wines with the recipes I create, I’m still trying to master remembering a lot of the details – the life of a sommelier, while impressive, is not for me. Becoming a part of The Sunday Supper Movement has helped considerably – between learning from my peers, attending the Food and Wine Conference in July, and now receiving expert advice from the founders of Gallo Family Vineyards, I have gained invaluable information I will be able to use for the rest of my cooking & baking (& wine pairing) life. 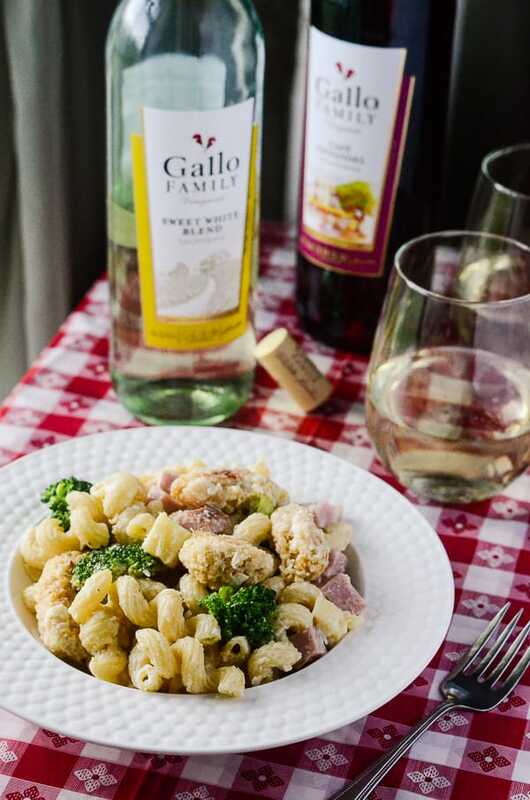 Since I usually just drink whichever wine I have on hand, I’m glad that Gallo’s website makes it so easy to decide which flavors will enhance your lunch or dinner. Their light-bodied peachy Sweet White Blend and fruity, summery Café Zinfandel pair beautifully with this relatively light pasta salad, which can either be eaten as a main dish or a side. Whatever your Labor Day plans may involve, I hope they properly celebrate the end of this long, hot summer! 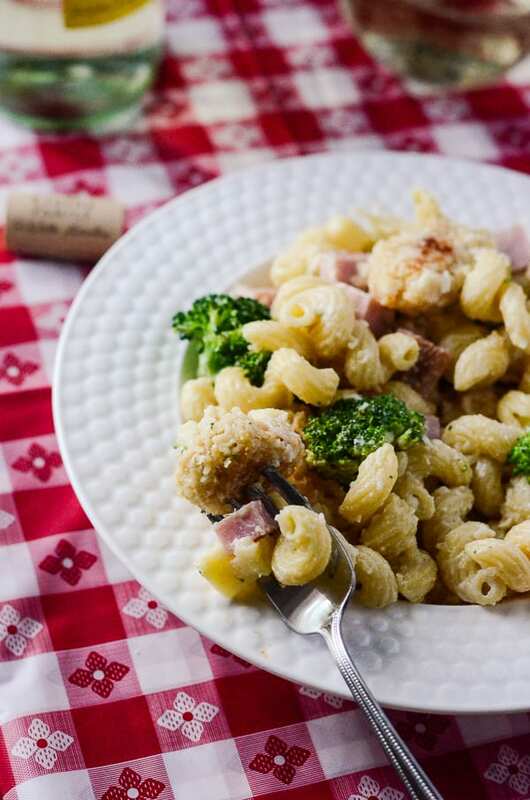 A perfect summer pasta salad with a bit of a fancier side – all the frills of Chicekn Cordon Bleu, but perfect to bring to any picnic, party, or BBQ! Cube raw chicken breasts and place in a bowl; set aside. Place flour & paprika, and bread crumbs in two separate bowls. In another bowl, whisk together eggs and milk. Working in batches, roll cubed chicken in flour, then dredge in egg wash, then coat with bread crumbs and place on prepared baking sheet. Bake chicken for 15-20 minutes, or until thoroughly cooked and browned. Remove from oven and set aside. While chicken is cooking, prep ham & cheese cubes, and broccoli. Place in a large bowl. Boil pasta according to box directions. Drain, rinse, and place boiled pasta in the bowl with the other ingredients. Add chicken to bowl and toss everything. In a saucepan, melt butter over medium heat. Add flour, whisking continuously for 1-2 minutes until a roux is formed. Slowly add the milk, whisking until incorporated. Stir in bouillon , salt, and pepper, and drop heat to medium-low and allow to simmer 3-5 minutes, stirring occasionally but allowing it to thicken slightly. Remove sauce from heat. Quickly add Dijon, Worcestershire, Parmesan, and mayonnaise (if desired), whisking briskly to melt cheese and combine ingredients. Pour sauce over everything in the bowl, tossing to coat and combine. Serve with your favorite wine, and enjoy! What drinks will you be pairing with your dinner this Labor Day? And here’s the celebration lineup! Look at all of these amazing Labor Day foods, created by my #SundaySupper friends! Looking for the perfect wine to pair with your Labor Day grub? Gallo Family Vineyards has a handy store locator to help! 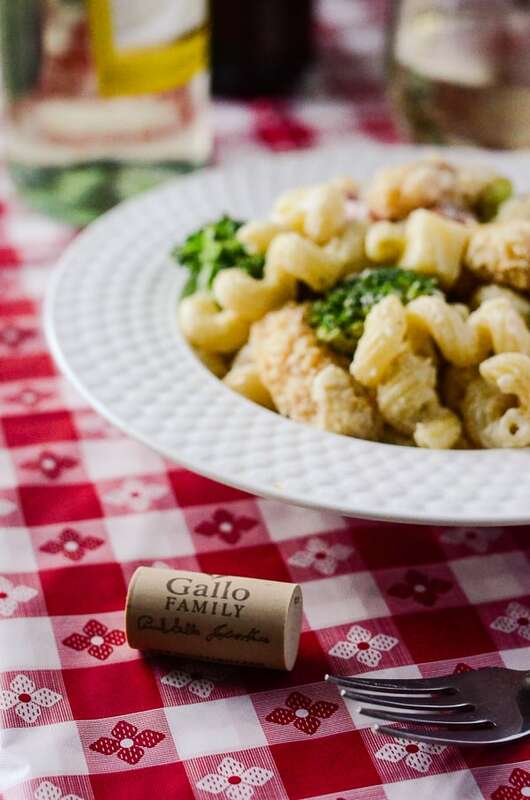 If you’re looking for a few great holiday ideas, make sure to visit Gallo Family’s Labor Day Entertaining blog post…and follow them on Facebook, Twitter, Instagram, & YouTube for wine-spiration all year long! This is a pasta salad I’m certain my husband and family would enjoy. Great things in the mix for sure. Your salad IS snazzy! lol Delicious, Erica! This pasta salad is so gorgeous…all my fave flavors! What a great change up to a traditional recipe. I love it! You know what? I would RATHER have your dish than traditional Cordon Bleu. There. I said it. What sweet memories of your courtship (despite the lucky bird poop!). This pasta looks like a crowd pleaser—I know my family would go nuts for it! 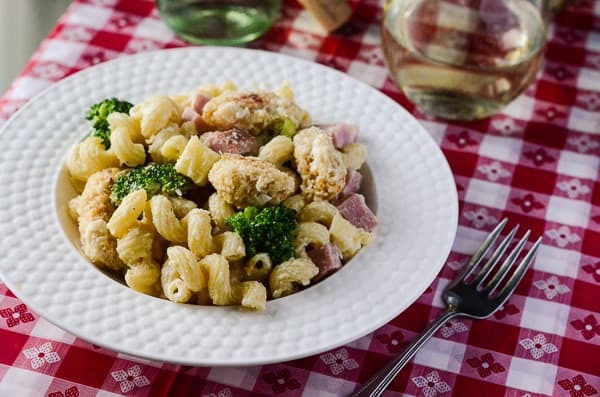 What a great idea to use the flavors of chicken cordon bleu in a pasta salad! I loved that you turned Chicken Cordon Bleu into a pasta salad! So perfect for a Labor Day picnic! Sorry the bird pooped on you! I am loving the flavors of this pasta salad! Delish! No Labor Day party is complete without pasta salad…especially one that is totally creative and unique!